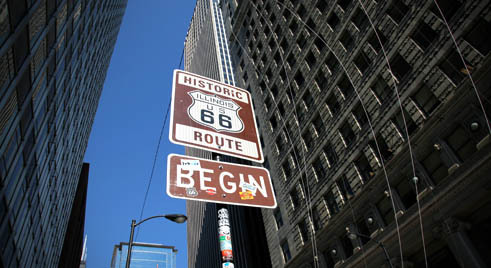 Illinois held the first completely paved section of Route 66. Likewise, it will also be the first state to decommission Route 66 to be replaced by the Interstate highway. Route 66 runs a little over 300 miles in the state of Illinois, the “Prairie State”, from Chicago to East St. Louis, on Missouri’s border. Illinois is the state of the “Muffler Men”, these gentle giants bordering the road ahead of tourist shops, service stations, garages or restaurants.